Rob Motl investigates the relationship between physical activity and multiple sclerosis (MS). 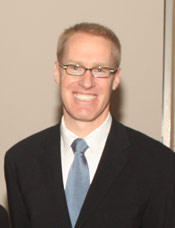 His goals are to quantify physical activity behavior in people with MS, to understand the major variables that affect physical activity behaviors, and to promote physical activity among people with MS.
"Multiple sclerosis is a disease that affects the ability to ambulate, and over time, it has a significant effect on quality of life," Dr. Motl said. He added that most disease-modifying medications lose their efficacy over time, failing to slow the progression of mobility impairment and the erosion of quality of life. He has published two papers showing that exercise training improves walking ability and the quality of life of people with MS, and another paper that shows that people with MS tend to be inactive. He and Department of Kinesiology and Community Health colleague Edward McAuley are currently piloting the Internet Physical Activity Intervention in MS, or In-PhAIMS Project, a 12-week online program that encourages people with MS to become more active, and helps them develop the skills they need to maintain and increase levels of physical activity. Armed with encouraging results so far from this study of 60 people with MS, he is in the process of writing a grant proposal to the National Institutes of Health to undertake a five-year longitudinal study of 300 people with MS.
Dr. Motl has previously studied the relationship between physical activity and quality of life, the use of cycling to alleviate muscle spasticity, and the impact of MS symptoms on physical activity over time. His ultimate goal is to generate scientific knowledge that supports physical activity as a behavior that has meaningful effects on delaying, slowing, stopping, or reversing MS symptoms. He hopes one day to open an exercise clinic on campus where people with MS could work with him and graduate and undergraduate students to design individualized programs to help them cope with the disease.